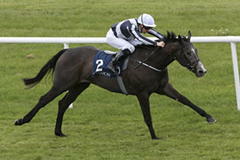 Jessica Harrington’s star filly Alpha Centauri, having proved her victory in the Irish 1,000 Guineas was no fluke with a scintillating display in the Coronation Stakes at Royal Ascot, was the 4-9 favourite to complete a Group One hat-trick on the July Course. Jockey Colm O’Donoghue kept things simple from the moment the gates opened, allowing Alpha Centauri to stride on in front against the rail. It was clear some way from home that several of her rivals were struggling to keep up, and O’Donoghue only had to keep his mount up to her work to score comfortably by four and a half lengths. Altyn Orda narrowly beat Clemmie to the runner-up spot, with Nyaleti a long way back in fourth. Harrington said: “She’s absolutely unbelievable. She was just hacking along and quickened up. Maybe she didn’t win as far as she did in Ascot, but she had to do the donkey work today and had to make all the running. “She is amazing. For the size of her, she loves that ground. I’m very lucky to train her. Asked about future plans, the trainer added: “She’ll probably go to Deauville next for the Prix Jacques le Marois. O’Donoghue said: “She’s a very special filly and I’m very lucky to ride her. “I think she ran a very good race and I think there’s still improvement in her. The Falmouth Stakes is named in honour of Evelyn Boscawen, the 6th Viscount Falmouth, who was a leading racehorse owner and breeder in the 19th century. It was established in 1911, and it was originally restricted to three-year-old fillies. The present system of race grading was introduced in 1971, and the Falmouth Stakes was initially classed at Group 3 level. It was opened to older fillies and mares in 1974. It became known as the Child Stakes in 1975, when Child's Bank began a period of sponsorship. It was promoted to Group 2 level in 1987, and it reverted to its original name in 1992. It was raised to Group 1 status in 2004. The Falmouth Stakes is currently held on the second day of Newmarket's three-day July Festival meeting.